Many of these papers, particularly the older ones, require a subscription. Some of them appear on my Researchgate page as manuscript copies. If you want to read something and can't get hold of a copy, feel free to drop me a line. Osborne T, Warner E, Jones P & Resch B (2019 in press) Performing social media. Geohumanities [subscription required]. Jones P & Osborne T (2020 in press) ‘Gaming and VR in geographical research’ in Nadia von Benzon, Mark Holton, Catherine Wilkinson & Samantha Wilkinson (eds.) 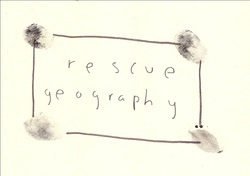 Creative methodologies for geographers. Sage, London. Jones P (2007) ‘The dismemberment of modern Birmingham’ in Peter Martyn (ed.) The City in Art ISPAN, Warsaw. This £1.5m project was funded by the Arts and Humanities Research Council (AH/J005320/1). Cultural intermediation is a process which connects different kinds of communities into the creative economy and wider society. It plays a critical role in raising aspirations, upskilling and building confidence, all of which are vital to allow people to engage with and benefit from one of the most dynamic sectors of the contemporary UK economy. This £40k project was funded by the Arts and Humanities Research Council (AH/J006580/1). We developed a smartphone app for Android phones (downloadable from Google Play). This allowed communities to map the things in their neighbourhoods that were important to them, simply by walking around taking pictures with their phone. Geotaggged photos and audio recordings were automatically uploaded to a community map. This £15k project (aka 'The Cities Pitch') funded by the Arts and Humanities Research Council was to develop an application for the larger Cultural Intermediation project. This exploratory work created a number of scoping papers and other outputs that helped build the larger research project. This £95k project was funded by the Economic and Social Research Council (ES/F004494/1). The initial project used walking interviews to investigate place and belonging in the Digbeth area of Birmingham, using GPS to map these stories to the locations in which they were told by participants. An unfunded follow up project used the same technique to explore the practice of cycle commuting, asking cyclists to narrate their ride home. Both projects involved collaboration with Dan Burwood, a documentary photographer, on an exhibition of the research findings. I have also been co-investigator on a series of other collaborative research projects.